Location Abbreviations/Explanations: CMP (town of Cape May Point); CMPSP (Cape May Pt. State Park); Cold Spring Inlet (entrance to Cape May Harbor, accessed from Two Mile Beach); SHPt (Stone Harbor Point). Cold weather continued to adversely affect freshwater duck numbers, with significant ice cover remaining on most fresh and brackish water. An unbanded and free-flying female Ruddy Shelduck that appeared at Erma 15 Jan (SWh) continued to be seen between Erma and Villas through at least 28 Jan (m. ob.). Though most North American records presumably refer to individuals that have escaped from captivity, it is worth fully documenting the species’ occurrences here, as it is also a candidate for natural vagrancy. A Cackling Goose was again reported on the pond at Champlain Drive, Villas 27 Jan (TB). Other noteworthy waterfowl included a female King Eider at Avalon’s 8th Street jetty 29 Jan (WK) and the continuing Harlequin Duck duo at Cold Spring Inlet through at least 25 Jan (m. ob.). The week’s only American Bittern was a single at Jake’s Landing 24 Jan (TR et al.). A hardy Tricolored Heron continued to play hide-and-seek in the marshes along Ocean Drive, between Cape May and Wildwood Crest, through at least 27 Jan (m. ob.). There were no reports of the lingering Osprey this week. Rough-legged Hawk has been in short supply; therefore 1 at Jake’s Landing 25 Jan (CV, DV) was notable. Beachfront Red Knots remained in the Wildwoods through the period (m. ob.) and a ‘Western’ Willet-- a first for 2015, was noted in the vicinity of Cold Spring Inlet 28 Jan (MP). Alcid reports were reduced, though that may be reflective of observer effort in recent days. A Dovekie was seen from Sunset Beach, on the heels of a strong coastal storm, 27 Jan (TJ). An adult Black-legged Kittiwake provided scope views from Avalon’s 8th Street jetty 28 Jan (TB). The year’s first Little Gull, an adult, was observed during a ferry crossing 26 Jan (DD, SD). 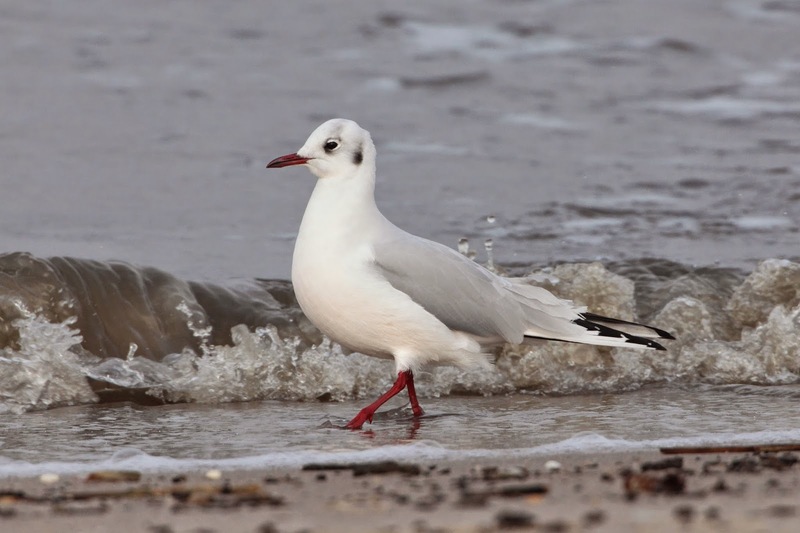 At least 2 adult Black-headed Gulls remained along the lower Delaware Bay, with regular reports from the Ferry Terminal and at Sunset Beach through 30 Jan (m. ob.). Forster’s Terns hung on through at least the middle of the week, with near-daily sightings from Sunset Beach until 27 Jan (m. ob.). A long-staying Eurasian Collared-Dove was most recently encountered at CMP 25 Jan (CBs). There were apparently no Snowy Owl reports this week, but at least 3 Short-eared Owls once again entertained dozens of observers at Jake’s Landing through the period. Predictably, the Tree Swallow flock at CMP dwindled through the recent stormy and progressively colder weather-- only a single individual was reported by 30 Jan (m. ob.). Additional lingerers included a Yellow-breasted Chat at CMPSP 28 Jan (WC) and 2 Orange-crowned Warblers at CMPSP 30 Jan (KH). Noteworthy on the barrier islands, an American Tree Sparrow was reported at SHPt 24 Jan (CBr, WC). Pierce’s Point was home to 229 Boat-tailed Grackles, a strong midwinter total, 29 Jan (SG). Common Redpolls were not as conspicuous this week but there were still several sightings, the most recent including 10 at SHPt 30 Jan (TB) and 1 at Villas the same day (SR). Tom Baxter (TB), Claudia Burns (CBr), Catherine Busch (CBs), Warren Cairo (WC), David Disher (DD), Susan Disher (SD), Sam Galick (SG), Kathy Horn (KH), Tom Johnson (TJ), Will Kerling (WK), Mike Pasquarello (MP), Tom Reed (TR), Steven Rodan (SR), Colette Visser (CV), Derk Visser (DV), Scott Whittle (SWh). The appearance of a scarce or rare bird is always the greatest inspiration for getting the coat on and getting out into the chilly January weather. After yesterday's forecast bad weather gave Cape May a wide berth, the sun returned today and provided even more impetus to get out and enjoy Cape May. An adult Black-headed Gull continues to attract people to Cape May Point at the moment, but it also gives a great excuse to take in the other treats of a bayshore day in January. Right now, there appears to be some good nursery schools of young fish off Sunset Beach and good numbers of birds are gathering to feed on them, offering some wonderful opportunities to enjoy a few species that you might not normally see so well. The presence of the Black-headed Gull should have everyone checking their field guides for the key identification features for that species, but that then encourages familiarity with the commoner confusion species - always a good first step when looking for something rare. Currently, Bonaparte's Gulls are putting on a wonderful performance here and it's a great opportunity to remind ourselves that not all gulls are aggresive brutes that go around in scavenging gangs! Bonaparte's Gull is one of the smaller gull species and even has certain tern-like qualities in their dainty flight and delicate bills. Most of the time they feed by picking food up at, or just below, the water surface. They may do this either in flight or by swimming; either way, when the fish shoals are in close, it's a great opportunity to enjoy these smart birds [photo by Mike Crewe]. As is so often the case, familiarity with the usual will help you pick out the unusual if it should show up. Spend time watching Bonaparte's Gulls and notice the clean white underwing, pale pink legs and black bill [photo by Mike Crewe]. Against the light, Bonaparte's Gulls look grayer on the underwing, but this grayness is uniform across the outer and the inner wing, while the delicate, black bill is still apparent [photo by Mike Crewe]. Sunset Beach's Black-headed Gull can be a little restless and it often disappears around the corner for periods of time. But watch for it flying past and note the deep red bill and legs, as well as the very blackish look to the underside of the outer wing which makes the white leading edge really stand out. 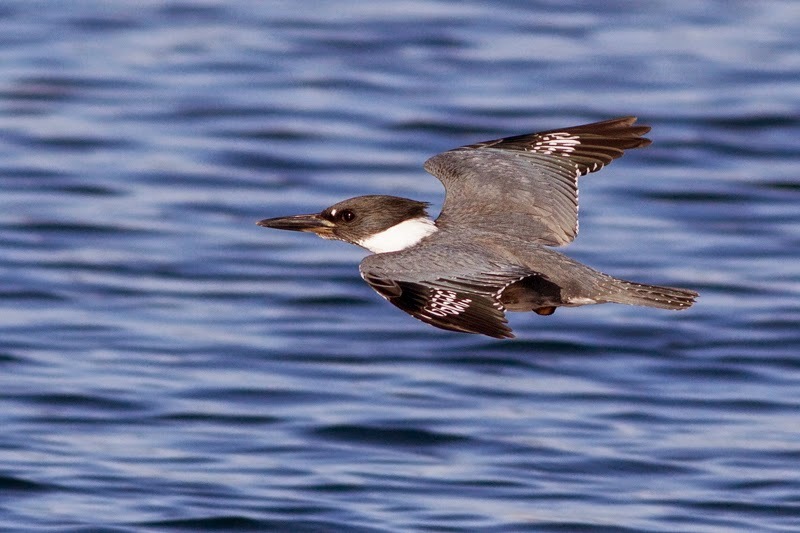 Black-heads are a little chunkier and longer winged than Bonaparte's too [photo by Mike Crewe]. As well as dainty gulls, the appearance of baitfish shoals has brought Red-throated Loons and even Horned Grebes in close - again providing a great opportunity to watch these birds up close. It is interesting to study the behavior of these birds as they come into the shallows to feed on fish - what's the typical duration of a feeding dive? How far do they typically travel underwater before surfacing again? So many interesting questions to answer - or you could just marvel at those bizarre red eyes! Red-throated Loons are wonderful birds when seen up close. The speckled pattern of the back gives them their scientific name, Gavia stellata, the latter word meaning starry. The head shape of loons can vary a lot according to the birds mood - bumpy like this usually means relaxed. But note the relatively delicate, slightly upturned bill of this bird, which helps to tell it from Common Loon [photo by Mike Crewe]. Come and enjoy CMBO's Saturday and Wednesday morning winter walks and get first hand guidance and tips on enjoying some great winter birding! Location Abbreviations/Explanations: CMP (town of Cape May Point); CMPSP (Cape May Pt. State Park); WMA (Wildlife Management Area). Cold weather continued to adversely affect freshwater duck numbers, with significant ice cover remaining on most fresh and brackish water. The award for week’s most bizarre report goes to the Ruddy Shelduck that appeared at Erma and Villas 15 Jan (SW, JD, TL). The bird, an unbanded female, has not been seen since. Though most North American records presumably refer to individuals that have escaped from captivity, the species is a candidate for natural vagrancy and free-flying birds should be thoroughly documented. A Cackling Goose remained on the pond at Champlain Drive, Villas through at least 14 Jan (m. ob.). Both a Cackling Goose and a Ross's Goose were seen flying with Snow Geese over West Cape May 16 Jan (MO). Notable ducks included 12 Canvasbacks and 21 Redheads that flew south past Avalon 11 Jan (TR), and multiple reports of the locally uncommon Common Merganser-- including a max of 9 at Tuckahoe WMA 14 Jan (SG). Grebes were in the news this week, headlined by 70+ Horned Grebes at Avalon 11 Jan (TR et al.) and at least 1 Red-necked Grebe at Avalon 11–12 Jan (m. ob.). Reports of American Bittern were limited to CMPSP, where 2 were noted 11 Jan (TB), followed by 1 on 13 Jan (WC). After nearly a week without sightings, a/the Osprey appeared at CMP 13 Jan (MP). The same or another was photographed at Stone Harbor Point 11 Jan (HT, LW). 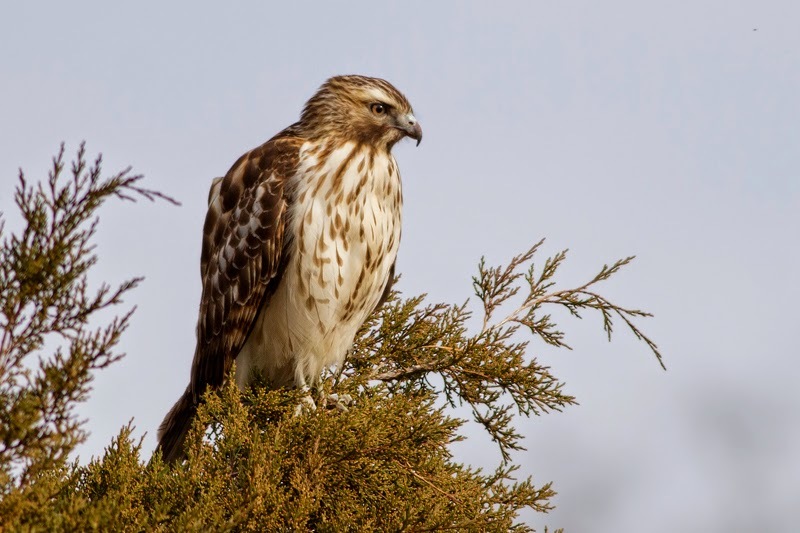 Tuckahoe WMA continued to host a dark-type Rough-legged Hawk through much of the week (m. ob.). An unprecedented southbound alcid movement, involving 2 Dovekies, 131 Razorbills, and 488 unidentified large alcids, was witnessed from Avalon’s 8th Street jetty 11 Jan (TR, m. ob.). Additional Razorbill reports from Avalon included 2 on 12 Jan (MP) and 1 on 15 Jan (TR), while at Cape Island several were scoped from CMP 11 Jan (GD) and 7 moved west past Cape May City 12 Jan (MO). Perhaps a product of increased observer effort, multiple Black-legged Kittiwakes were tallied--7 were offshore CMP 11 Jan (GD et al.) along with 2 offshore Avalon 13 Jan (TR). An adult Black-headed Gull once again appeared in the vicinity of the Cox Hall Creek outflow, near the south end of Villas, 15 Jan (JN, DW, m. ob.). A long-staying Eurasian Collared-Dove was most recently encountered at CMP 12 Jan (SG); there were no White-winged Dove sightings this week. 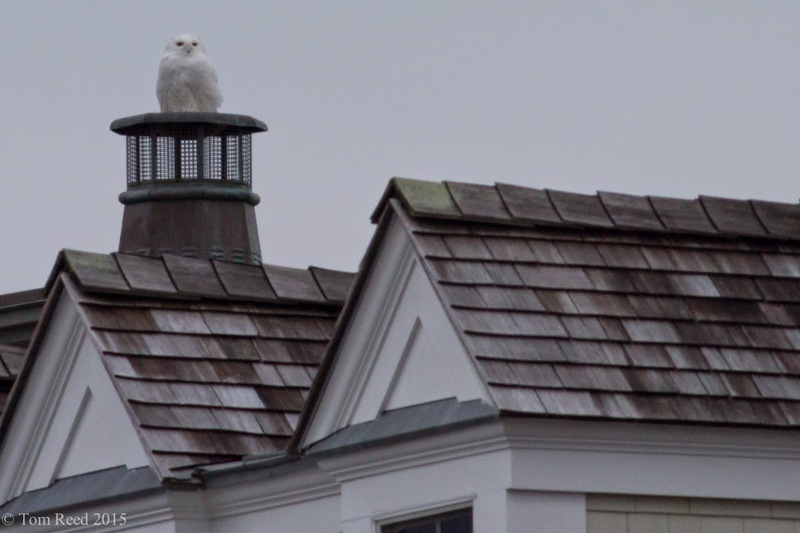 The year’s first Snowy Owl was discovered roosting on a rooftop at 61st Street, Avalon 13 Jan (TR et al.). At least 1 Short-eared Owl again entertained observers at Jake’s Landing through the period, and another was seen from Nummy Island 13 Jan (CM). CMPSP’s Eastern Phoebe continued through 16 Jan (JK), and at least 60 Tree Swallows survived the Cape Island winter through 16 Jan (m. ob.). 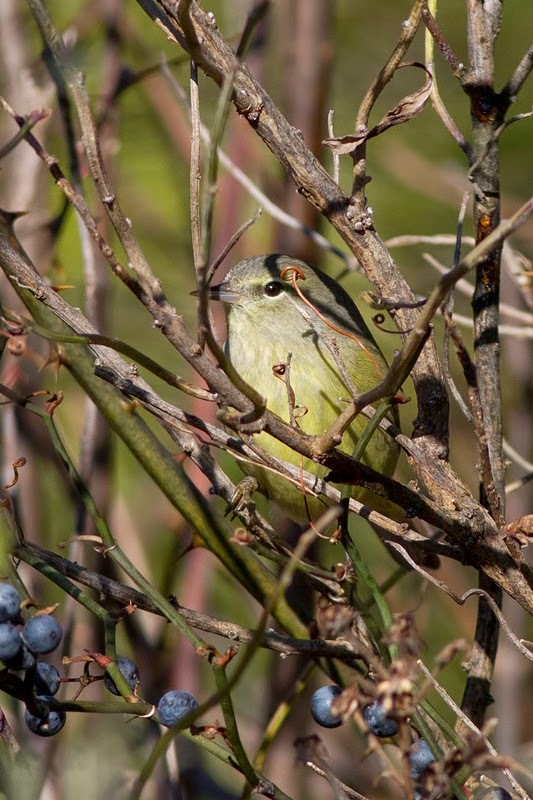 Additional lingerers included at least 1 Orange-crowned Warbler at CMP through 13 Jan (m. ob. ), a Palm Warbler at Rea Farm/Beanery 15 Jan (BB), a Yellow-breasted Chat at CMPSP 10 Jan (v. ob. 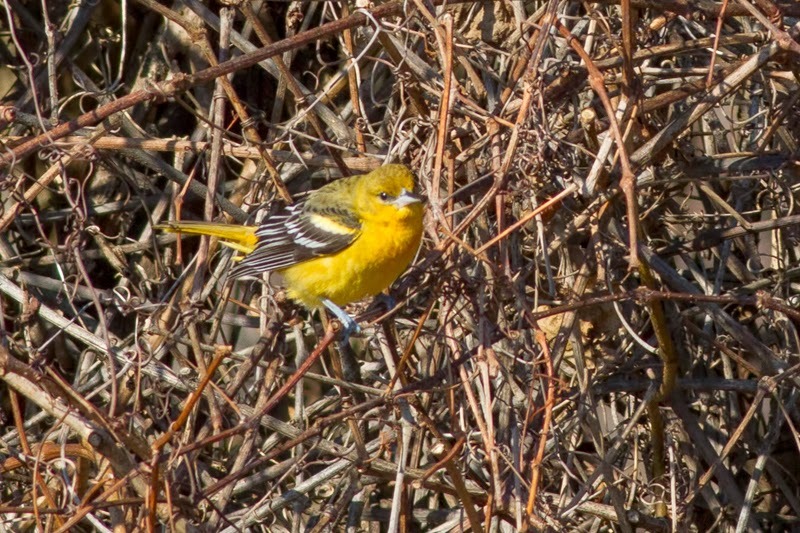 ), and a Baltimore Oriole at CMPSP 16 Jan (SG). Always notable at Cape Island, a single American Tree Sparrow was reported at CMPSP 11 Jan (SS). After a notable absence during early winter, Pine Siskins became more conspicuous in recent days-- at least 7 reports came in from Cape Island, including a flock of 11 over CMP 11 Jan (MO). A few more Common Redpolls followed behind last week’s single sighting, such as 1 over CMP 10 Jan (DF), 6 over CMP 13 Jan (MP), 1 at Reed’s Beach 14 Jan (TR), 1 at CMBO’s Northwood Center 14–16 Jan (BM, m. ob. ), and 1 near Villas 15 Jan (JN, DW). Barb Bassett (BB), Tom Baxter (TB), Warren Cairo (WC), Glen Davis (GD), Jim Dowdell (JD), Don Freiday (DF), Sam Galick (SG), John King (JK), Tony Leukering (TL), Christina Marks (CM), Brian Moscatello (BM), Josh Nemeth (JN), Michael O'Brien (MO), Mike Pasquarello (MP), Tom Reed (TR), Susanna Stippick (SS), Harvey Tomlinson (HT), Dustin Welch (DW), Scott Whittle (SW), Linda Widdop (LW). eBird. 2012. eBird: An online database of bird distribution and abundance [web application]. eBird, Cornell Lab of Ornithology, Ithaca, New York. Available: http://www.ebird.org. (Accessed: 16 January 2015). Fogg, B. 2013. Keekeekerr: Recent Text Alerts. Available: http://keekeekerr.com/textalerts/keekeekerr. (Accessed: 16 January 2015). While an icy blast might be all it takes to keep you indoors for a few days, there's certainly plenty of reasons to be looking for birds around Cape May right now. If you want to brave the chilly conditions along the beachfront, there seems to be a Snowy Owl lurking somewhere out on the barrier islands, and last reported from 61st Street in Avalon. The stone jetties are alive with Purple Sandpipers (at least 30 were off Coral Avenue at Cape May Point a couple of days ago) and, if you take a scope and have plenty of patience, it's worth scanning the Bonaparte's Gull flocks out in the Delaware Bay for the odd Black-legged Kittiwake that is lurking among them - though these birds seem to be feeding well offshore right now. If you want a modicum of sanity about your birding during this cold snap, you might make a hot mug of coffee, grab a chocolate brownie and snuggle down in your favorite chair to view the backyard feeders, for something of interest may be lurking there. Brian Moscatello took a casual glance out of the Northwood Center windows today and noticed a Common Redpoll at one of the feeders. This is a bird of very unpredictable appearance in Cape May and getting one at the feeder is certainly a real bonus! These nomads from the north don't head south in any number most years, but maybe we can hope for more to show up. To date, the only New Jersey records this month have come from Cape May so there's no clear sign of a movement yet - but you never know. Of course, your best chance for a Common Redpoll right now is to head to the Northwood Center and enjoy a cup of coffee with us - and don't forget to check for American Woodcocks along Sunset Boulevard on your way! When the bayshore looks like this, it's tempting to stay indoors, but such watery sunsets on an icy day can be truly spectacular and it's worth making the effort now and again [photo by Sam Galick]. 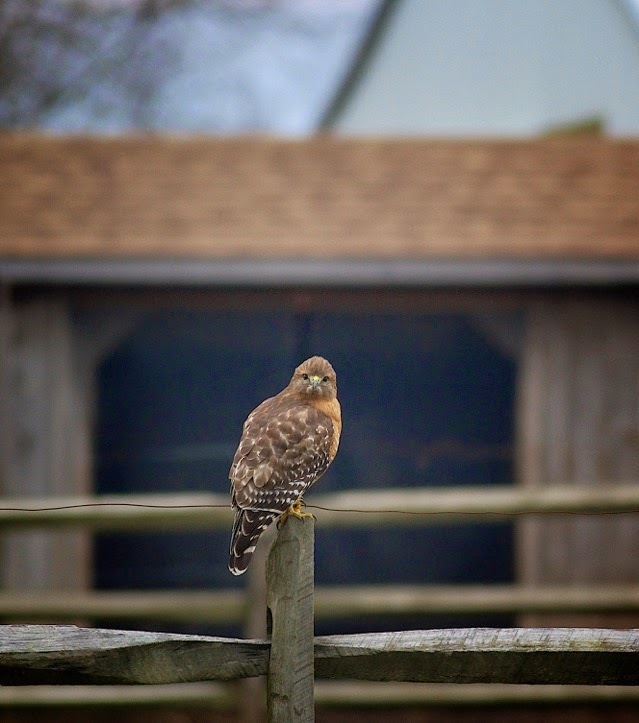 Keep an eye out for Red-shouldered Hawks checking out your feeder. This juvenile bird at the Hawkwatch Platform this week is perhaps not the most obvious of individuals and it can sometimes be difficult to tell them from Red-tails. In this slightly odd pose, the bird looks broad-shouldered and small-headed like a Red-tail, but notice the thick, dark tail bands, the even distribution of markings on the underparts and the suggestion of a rusty shoulder patch (difficult to see in this cropped photo, but worth looking for in the field) [photo by Linda Widdop]. In contrast to the juvenile, adults - like this one on Sunset Boulevard - can be easy to tell from Red-tails. This bird shows a classic rusty wash to the underparts and bold, black-and-white checkering on the wings [photo by Stephanie Vacek]. Some birds can be easier to see during cold snaps than at other times, especially if they get drawn to road surfaces which get thawed by salting. 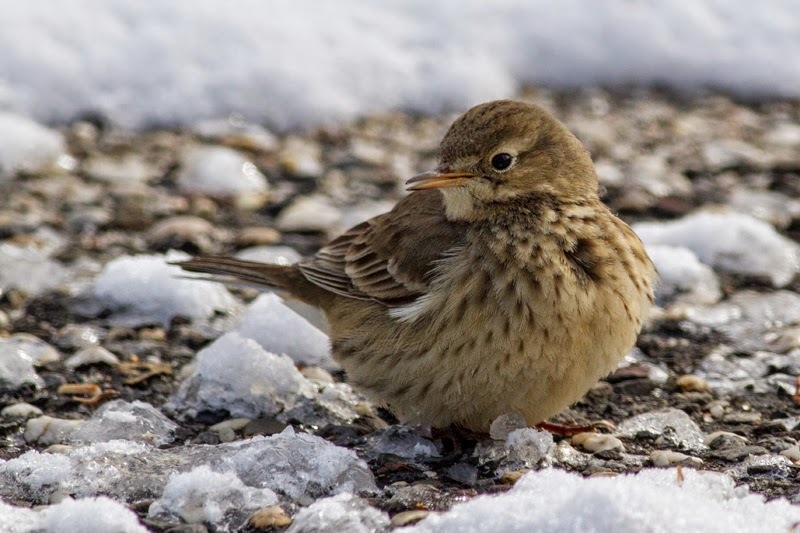 American Pipits have been reported from a number of places around Cape May these past few days and most sightings have involved birds on thawing roadsides. Stay in the car and you can get amazingly good views of these birds if you are careful [photo by Sam Galick]. Take a careful look at the birds at your feeders right now and let us know if a Common Redpoll comes winging in! Look for a rather plain, streaky bird, with a red cap on the forehead and a small black bib. Adult males can be pink-washed on the chest but most are likely to be first-winter birds like this one, with no pink on the chest. Ageing redpolls can be difficult as there is a lot of individual variation, but this bird has a contrast in its tail feathers - showing two inner pairs with quite fresh, rounded tips, and the rest of the feathers being more pointed and a little more worn at the tips. The presence of such a contrast in the feathers indicates a partial molt and makes this a young bird [photo by Mike Crewe]. Location Abbreviations/Explanations: CMP (town of Cape May Point); CMPSP (Cape May Pt. State Park); SHPt (Stone Harbor Point); WMA (Wildlife Management Area). Cold weather during the second half of the period adversely affected waterfowl numbers, with significant ice cover on most fresh and brackish water, along with nearshore waters of the Delaware Bay by 9 Jan. A Ross’s Goose was gleaned from a flock of 2500 Snow Goose at Reed’s Beach 7 Jan (TR), though numbers of geese have decreased there since. A Cackling Goose continued at Champlain Drive, Villas through 5 Jan (m. ob.). There were several reports of Tundra Swan, including a flock of 12 fleeing southward over CMP 8 Jan (MS, DW). Also at CMP, at least 1 Eurasian Wigeon hung on through 9 Jan (m. ob.). Other notable ducks included a Canvasback and 3 Redheads at Cape May Court House 4 Jan (TB, TG), and a flock of 22 Common Eiders at the north end of Ocean City 3 Jan (JC). A Red-necked Grebe was also viewed in the same area 3 Jan (JC). Lingering waders included 2 American Bitterns at SHPt 3 Jan (HT) and a Little Blue Heron along Ocean Drive through at least 6 Jan (m. ob.). An Osprey survived at CMP until 6 Jan, but has not been encountered since (m. ob.). A dark-type Rough-legged Hawk was relatively cooperative at Tuckahoe WMA through much of the week (m. ob.). At least 52 American Oystercatchers continued to tough it out at Hereford Inlet 5 Jan (WC), while 52 Red Knots made for a nice January tally at Two Mile Beach 6 Jan (KH). Two Dovekies whizzed past the north end of Ocean City 3 Jan (JC), representing the latest in a series of land-based reports during the past two weeks. Particularly surprising was a Razorbill reported in Delaware Bay from High’s Beach 5 Jan (WK). A White-winged Dove, first noted at CMP 2 Jan, was last reported there 4 Jan (FL); a long-staying Eurasian Collared-Dove was most recently glimpsed at CMP 3 Jan (VE). At least 4 Short-eared Owls entertained observers at Jake’s Landing throughout the period; 2 were once again seen from SHPt 3 Jan (HT). A Northern Saw-whet Owl flashed in front of a vehicle traveling past mile 2 of the Garden State Parkway 7 Jan (GD). Most local winters feature a hardy Eastern Phoebe or two, such as the one that persisted at CMP through at least 4 Jan (m. ob.). Impressive was the 80 or so Tree Swallows that survived at CMP through the week (m. ob.). Additional noteworthy lingerers included 5 Palm Warblers and a Baltimore Oriole at the Rea Farm/Beanery 5 Jan (SG), single Orange-crowned Warblers at Cape May City 6 Jan (WC) and CMPSP 8 Jan (TB), and a Yellow-breasted Chat at High’s Beach 6 Jan (WK). A couple American Tree Sparrows were reported from Tuckahoe WMA, the county’s most reliable site for the species, 7 Jan (SG). 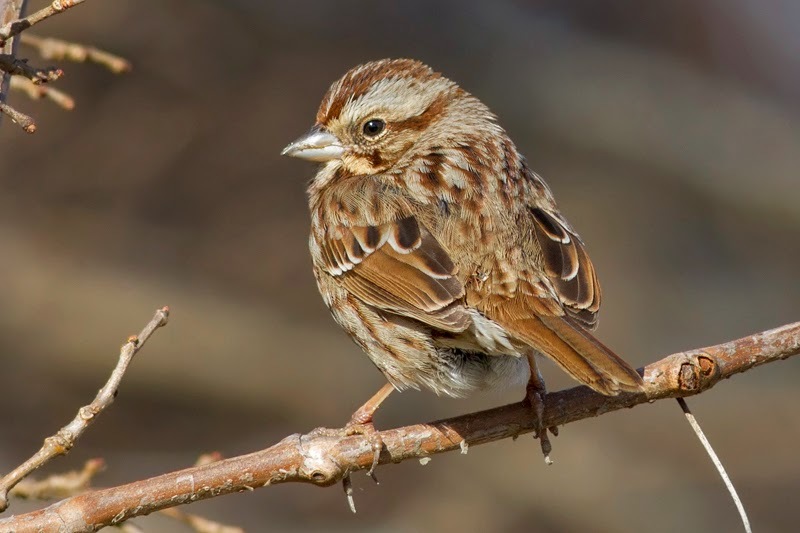 Following strong movements during Fall 2014, both Purple Finch and Pine Siskin have once again become scarce. The period’s only Pine Siskin report entailed a single bird at West Cape May 4 Jan (MO). There have been widely scattered reports of Common Redpolls in the Mid-Atlantic recently, including a flock of 5 that flew over CMP 7 Jan (GD). Tom Baxter (TB), Warren Cairo (WC), Jacob Cuomo (JC), Glen Davis (GD), Vince Elia (VE), Sam Galick (SG), Tom Gleason (TG), Kathy Horn (KH), Will Kerling (WK), Frank Lenik (FL), Michael O'Brien (MO), Tom Reed (TR), Maria Smith (MS), Harvey Tomlinson (HT), David Weber (DW). eBird. 2012. eBird: An online database of bird distribution and abundance [web application]. eBird, Cornell Lab of Ornithology, Ithaca, New York. Available: http://www.ebird.org. (Accessed: 9 January 2015). Fogg, B. 2013. Keekeekerr: Recent Text Alerts. Available: http://keekeekerr.com/textalerts/keekeekerr. (Accessed: 9 January 2015). 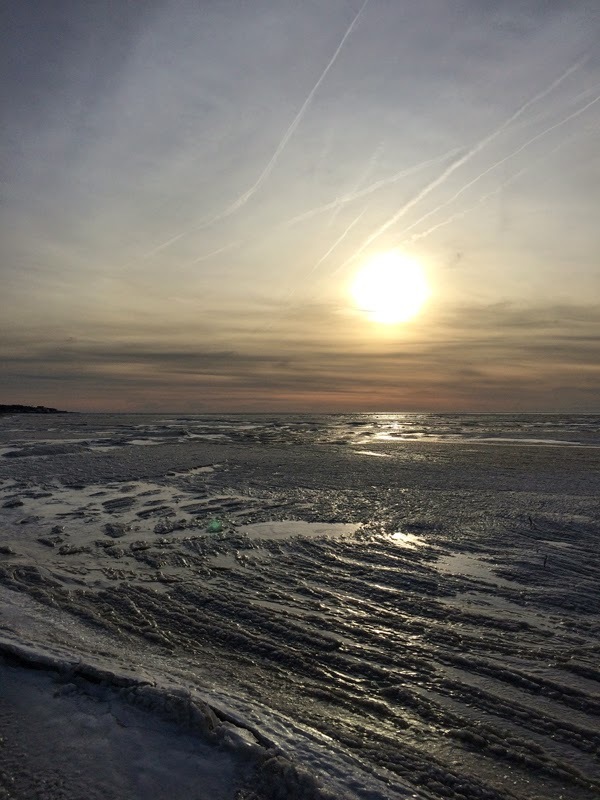 Winter's icy hand is sweeping across Cape May right now but, though it's cold, the forecast looks sunny for the weekend and our annual 'Winter Warmers' workshop will be taking place on Saturday and Sunday. 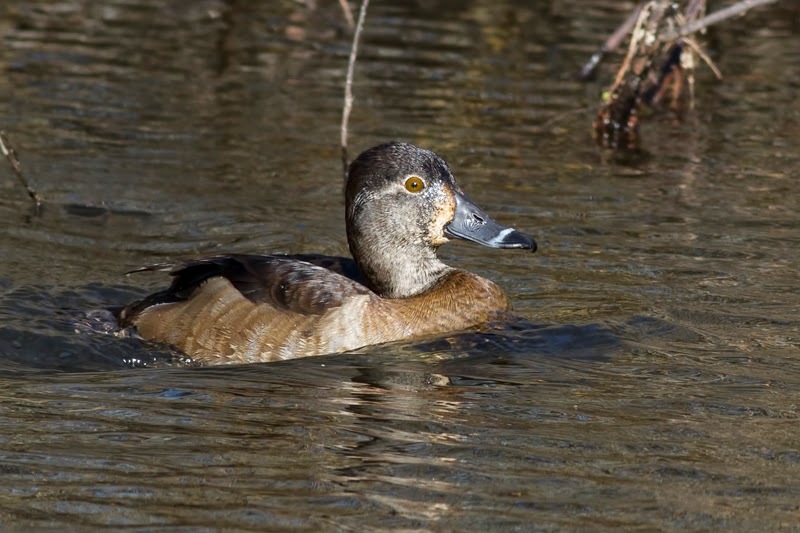 This is a great time of year for viewing the many species of ducks that make their winter home in Cape May and the indoor section of our workshop will include a photo identification session, giving us a chance to get to grips with these sometimes tricky birds. Winter in Cape May always throws up a suite of unusual birds too and every year is different, the selection being a product of weather patterns over the previous month or two. To get you all fired up to wrap up warm and come join us, here's a selection of Cape May photos that I just received from Sam Galick - all waiting for you around Cape May right now!! 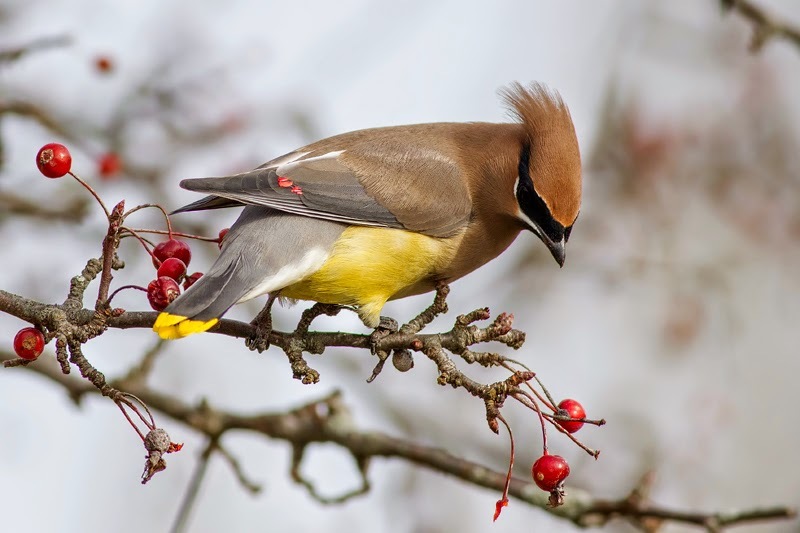 Cedar Waxwings are always guaranteed to brighten up a day when they descend to feed on berries that are now just being softened up by the freeze and thaw of winter [photo by Sam Galick]. Like them or not, there will always be little brown jobs to stare at and get us confused! Wintering sparrows can seem bewildering at first, but when you get views like this of a Song Sparrow - they're not so bad, and there's much subtle beauty there to be enjoyed [photo by Sam Galick]. 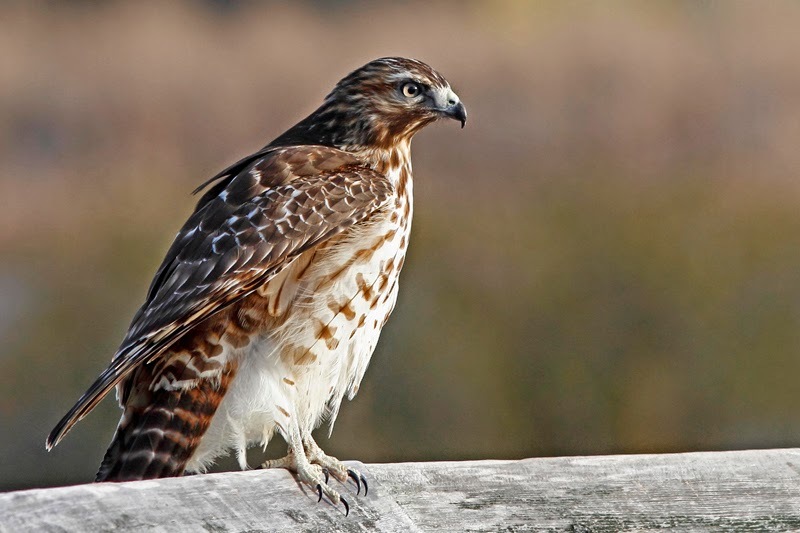 Many of the raptors that pass this way in fall are well to the south of us and if you see a raptor checking out your backyard feeders in the winter here, chances are it will almost certainly be either a Cooper's Hawk or - like this one - a Red-shouldered Hawk. Red-shoulders can be quite approachable at this time of year and we will hope to get views like this over the coming weekend [photo by Sam Galick]. Each winter, a few birds don't read the books and decide to stay well north of where their siblings are hanging out. 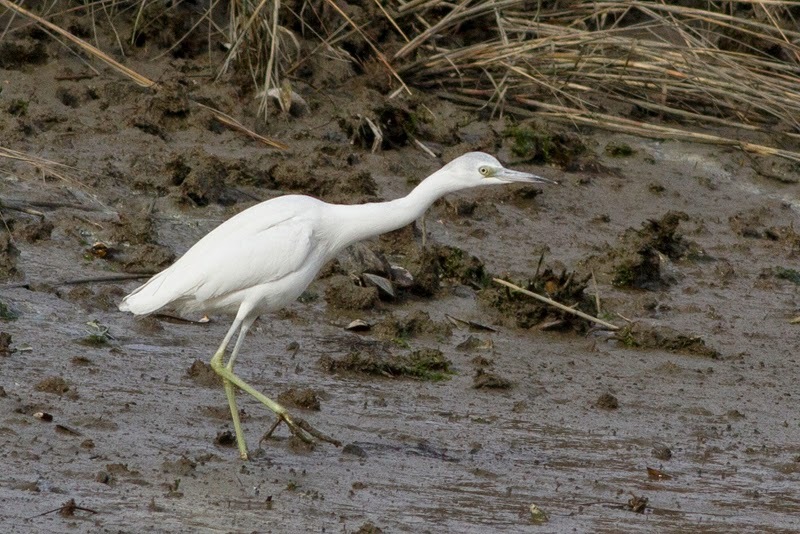 This Little Blue Heron is showing nicely the classic white plumage, greenish legs and two-toned bill of a first-winter bird [photo by Sam Galick]. As freshwater ponds freeze up temporarily, Belted Kingfishers and other fish-eating birds move down to the saltier waters of the coast. We can't promise views like this, but there should be a kingfisher or two lurking around the back bays this coming weekend [photo by Sam Galick]. Returning to the 'hanging out a long way north' theme, this Baltimore Oriole may well be regretting that it's not in Costa Rica with its mates right now! [Photo by Sam Galick]. Though Orange-crowned Warblers are regular winterers around Cape May in small numbers, finding them is no easy task. Tangles of greenbrier, bramble and rose bushes can harbor these birds - but you have to be diligent to spot one staring out of the thicket - like this one at the state park [photo by Sam Galick]. For more information or to book on our Winter Warmers workshop, call our Program Registrar on 609-861-0700. And if you feel like just coming for one day instead of two, we can sort that out for you also!